View of barn and farmhouse from the upper fields. The new stone patio before installation of the tent. The austere beauty of the Great Hall is like a blank slate. Make it your own. The 75' ceiling span gives a soaring feeling. Plenty of extra floor space up on the balcony! The full expanse of the south-facing upper fields. Early fall. View across the valley from the Wedding Circle in the upper fields. View of Ripley Road from the cul de sac in fall. Nice to be at the end of the road! Surreal colors in early spring. The maples just starting to green after a long winter. View from the barn. From its settlement in 1798 as a rugged New England farm, to the illustrious Montague Farm commune (1968-2002), to Zen Peacemakers (2002-2011), 177 Ripley Road seems to inspire magic. Its legacy is multifaceted: community building, spirituality, art, environmentalism and activism (for more on this, click HISTORY). 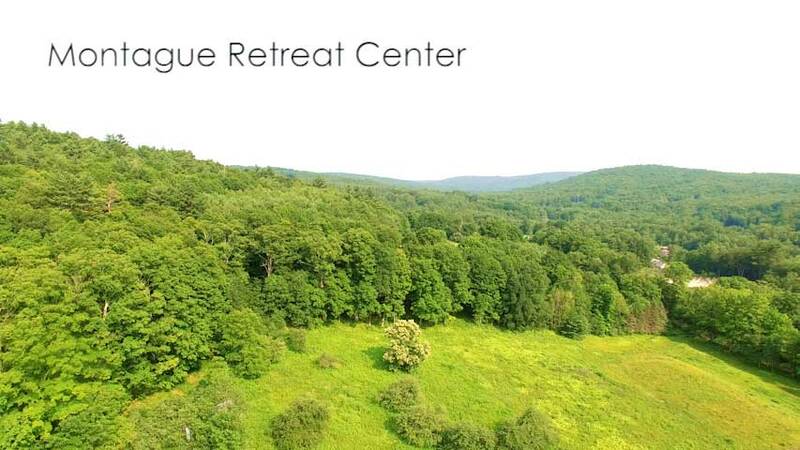 Montague Retreat Center's mission is to extend that legacy by making this unique place available to the public for private functions, workshops, cultural events, and overnight retreats (corporate as well as educational). The Great Hall, our stunning, geothermal assembly space, is currently available for day or evening use (for more on this, click RENTALS). Our spacious commercial kitchen and tented stone patio are perfect for large functions (for more on this, click WEDDINGS). Our long-term building plan calls for accommodations for 54 guests and we currently have accommodations for 10. Visiting Montague Retreat Center? Click HERE for an important travel note (or use Google Maps - Apple brings you to the rear entrance, which is closed). beauty to inspire your next event.